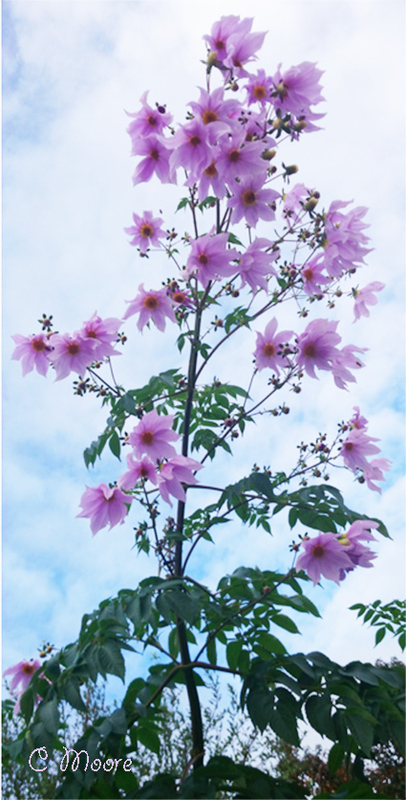 Tree dahlia or Dahlia Imperialis are herbaceous perennial which is a native to Central America, Mexico, and Columbia. These dahlias are different from the regular Dahlia plant as they grow to a height of 2 to 6 meters. The stems of the plant resemble bamboo canes and have bipinnate leaves. The flowers are usually lavender coloured with a yellow centre. Its flowering season is autumn through to winter. Other coloured varieties of pale pink, double white and a deep red also exist. This plant prefers a frost-free climate and needs a sunny spot in your garden. If grown in a frosty areas of Australia, the plant will need some shelter, and hopefully the plant will finish flowering and beat the winter frosts, otherwise the tree dahlia flowers will be ruined. Sometimes staking is necessary to protect the brittle stems from the wind. The plants are generally pruned in winter season after the flowering is complete. This is a fast growing species and growth depends on the daylight availability. The spent canes are cut back close to the ground. If you want a compact plant, prune the plant during early summer. The plant needs seasonal care, a rich, well-drained soil, full sun, and a good feeding to attain proper growth and flowering. Tree dahlia requires regular maintenance as they grow quite tall and are prone to wind and frost damage. You need to remove hollow and old stalks. Remove the leaves near the base of the stem when they start to die. Cut the canes, leaving a few inches above the soil to make the plant develop stronger canes. The propagation process of tree dahlia is very simple. You can use seeds or stem cuttings for propagation. The stem cuttings need to be at least 12 inches long and should have two or three nodes. The plant produces roots and shoots from these nodes. You need to plant the stems in trenches in the soil, which is at least 10cm deep. Lay the stem cuttings horizontally in the trench and cover the stems with soil. The cuttings will produce new growth and will flower in the next autumn. If you need to form a thick cluster of the plant in the garden, you can use three cane cuttings in a trench. Nip the new growths when it reaches 1 meter high. This will make the plant sturdier and will protect the plant from wind damage. The tree dahlias can also be propagated by transplantation of the tubers. It is necessary to plant the cuttings as early as possible. You need to use a well-draining potting mix which contains 1 part soil, 1 part perlite or sand. Mix some slow-releasing fertiliser to the potting mix. Take a pot of about 2-4 litre in size. Plant the cutting vertically halfway in the potting mix. One of the nodes should be under the soil. Make sure that you are not planting the cane upside down. Do not cram the soil down hard and water lightly to keep the soil moist. Keep the pot in bright light away from the direct sunlight. The cuttings will produce roots within 1 to 2 months. Place the pot in the direct sun only after the new growth reaches at least 20cm. Once the new plant reaches to 1m height transplant it to the suitable sheltered location in your garden. Hi Geoff, do you think I should change it, I think it is good for SEO. There is nothing worse than spelling mistakes thanks so much for letting me know, Cheers Christine.